Percy Trompf was born at Beaufort before the family moved to Ballarat where Trompf was educated at Sebastopol Primary School before becoming one of the earliest students at the Ballarat School of Mines' Ballarat Junior Technical School where he received his certificate in 1917. He also undertook the Ballarat Technical Art School Industrial Design Course in 1916. 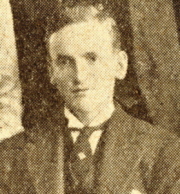 During his Art training Percy Trompf was part of the Ballarat School of Mines (SMB) Students Magazine committee, serving as editor in 1921 and Secretary in 1922, the same year he held the position of secretary of the SMB Students' Association. Trompf joined the Melbourne commercial art firm of Giles & Richards The Ballarat Star reported on 18 May 1923: Mr Percy Trompf, a student of the School of Mines Art School, who recently passed a series of examinations, has secured an excellent position in the office of Messrs Giles and Richards, commercial advertisers, of Melbourne. Trompf later established his own studio where he employed a number of artists. In 1928 Trompf was an office bearer on the inaugural committee of the SMB Past Students Melbourne branch. In that year he wrote an article for the SMB Magazine relating to hints for future Commercial Artists: ... With regard to poster work particularly, lighting is the all-important factor. Strong light and shadow thrown on the objects of figures to be painted, if carefully reproduced by the artist, will make the poster concerned stand out on the hoardings, even if details are left out and nothing but two tones to each color are included. For example, take a figure of a man in a dark-blue overcoat. It that subject were treated in two tones for flesh (light and shade) and two tones of blue for the overcoat (light and shade), then the result would be an ideal poster. All this, of course, simply relates to method of treatment; and it is taken for granted that drawing, lettering and general layout of the poster are good. Further, whenever possible, the student should consult any friends connected with printing, lithography and engraving, and gather general information about the various methods by which the efforts of after-years will be reproduced. One's reputation commercially is largely dependent on these sister-crafts; and therefore it is obvious that the artist who dies work which is easy to reproduce successfully, will build up a better name than the equally good artist without such technical knowledge. P. Trompf. (SMB Students' Magazine, 1928. By 1933 Trompf was well-known as a poster artist. He offered to judge the poster competition held at Ballarat's first Ideal Homes Exhibition. Many students from the Ballarat Technical Art School entered posters in the state wide competition. The Ballarat Artists' Society, closely associated with the Ballarat School of Mines, invited Percy Trompf to deliver a lecture on what constitutes a good poster and how its construction should be approached in September 1947. At that time Trompf was a Flight Lieutenant with the R.A.A.F. He was commissioned as a pilot in June 1942 also working as a camouflage officer. Percy Trompf died at Heidelberg on 17 July 1964. He is best known for his railway posters, Bryant and May posters, and the Captain Cook poster. 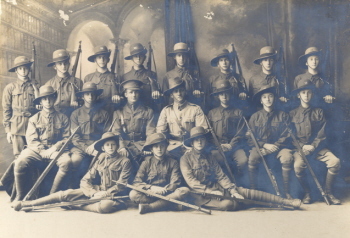 Image Caption (left): Ballarat Junior Technical School (BJTS) Senior Cadet Team, 1918. In 1918 The BJTS cadets won competitions at Stawell, Colac, Maryborough, St Arnaud, Mildura and Ballarat's South Street 'A' Grade. Back: R. Hirt; PERCY TROMPF; J. Nicholls; R. Serjeant; J. Jones; A. Hannah; A. Duncan; L. Lindsay. 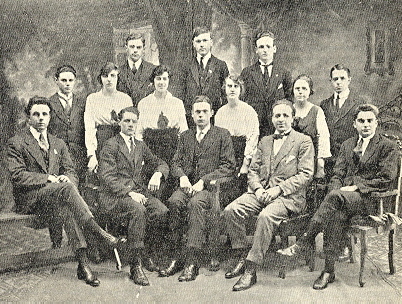 Image Caption (right): Ballarat School of Mines Students' Magazine Committee, 1922. Back row from left: H.A. Palmer (Chemistry); G.R. Simons (BJTS); PERCY TROMPF (Treasurer).